Very few temperature stations in southern Africa. The following figures show the IPCC model plots (from AR4 Fig 9.12) for Southern Africa (pink= models with CO2, blue= models without CO2) and (right) with average temperature anomalies for 1880 – 2006 (from the GHCN database shown above) superimposed. The temperature is almost always within the IPCC model area without CO2. There are very few stations with either > 40 years of data, or data in the last couple of decades in the NASA GISS Database. Below are all stations with recent or long-term data. Only the two urban stations in Pretoria and Pietersburg show any warming trend over their respective data sets (i.e. the whole set of data, not just the last couple of decades). A 2006 paper provided precipitation reconstructions for Zimbabwe based on tree rings (Therrell, M.D., D.W. Stahle, L.P. Ries, and H.H. Shugart. 2006. “Tree-ring reconstructed rainfall variability in Zimbabwe”. Climate Dynamics, 26, 677–685). 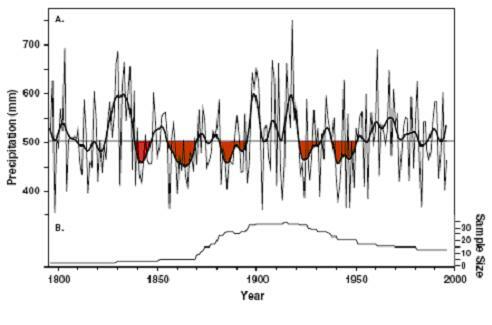 The following figure is from that paper, showing precipitation from 1800 to 1995, with significant drought periods highlighted in red areas. Zimbabwe has also recently had droughts. The following figure shows the only long-term precipitation station in Zimbabwe, from the NOAA database. According to the United Nations “Deforestation is one of the major environmental problems facing Zimbabwe. About 70,000 to 100,000 ha of forest is cleared every year and the forest cover is estimated to be declining at a rate of 1.5% per year (UNDP, 1997). The main causes of deforestation include increasing demand for land for agricultural development and dependence on wood as fuel in the rural areas. Deforestation has caused land degradation and siltation of rivers and dams. A large amount of biodiversity has also been lost and so has the socio-cultural role of forests. The loss of forests is somehow linked to the growing poverty in the rural areas… Despite the fact that only 25% of the land in Zimbabwe is suitable for agricultural use, due to poverty and the lack of alternative livelihoods, people continue to exploit limited natural resources for their survival. Consequently, water scarcity and drought are affecting a significant portion of the country.” [http://www.un.org/esa/earthsummit/zimbab-c.htm]. Forget CO2 – deforestation is the main environmental problem in Africa, resulting in droughts as well as erosion due to flooding when rains occur.